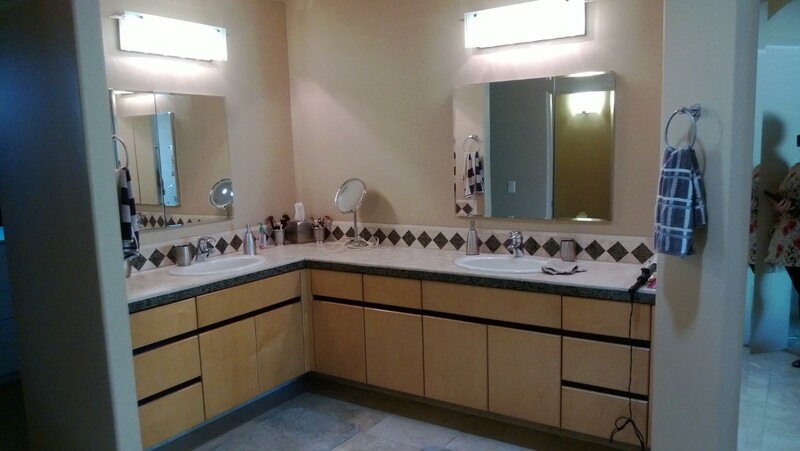 The current master bathroom has the benefit of having a wall hung vanity, but it’s very yellow and has a black base cabinet, so it’s one big striped mess, all supporting a travertine tile countertop and drop in sinks. Blecht, I say, blecht! There just aren’t enough diamonds at the vanity, can we please have more at the tub? But maybe make them bigger and more spread out. This is what you get when a builder tries to be a designer… you know who you are! 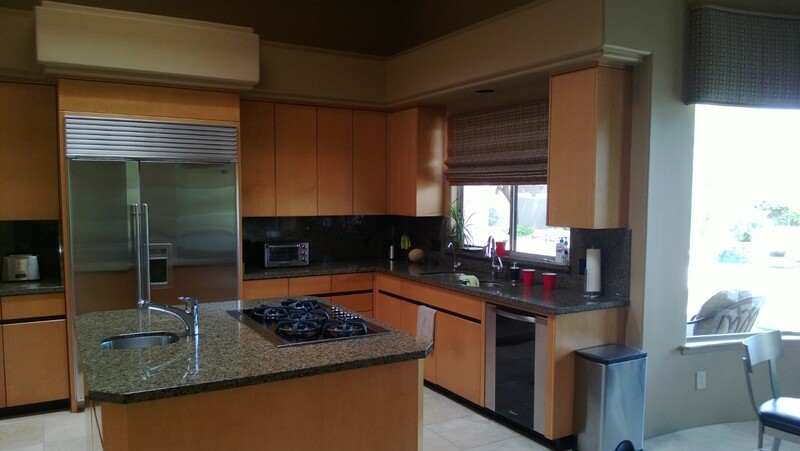 Continuity throughout a room is important- this is not a good example. 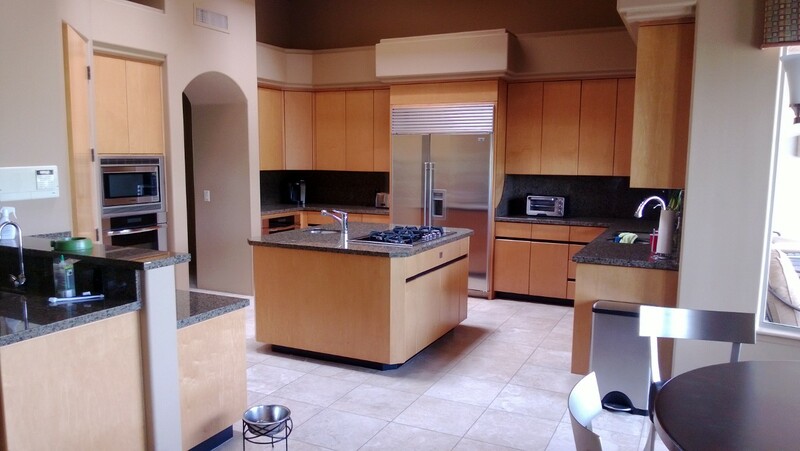 The current kitchen is flat and one dimensional with absolutely no break in the cabinet lines and slab granite backsplash. Dark, dreary and depressing, for sure! Blah, blah, black slab, have you any taste? Here’s a clue in kitchen design: if the only place that you could place food for a party has a giant gas cooktop and a prep sink in it, you can consider it an epic fail for entertaining. 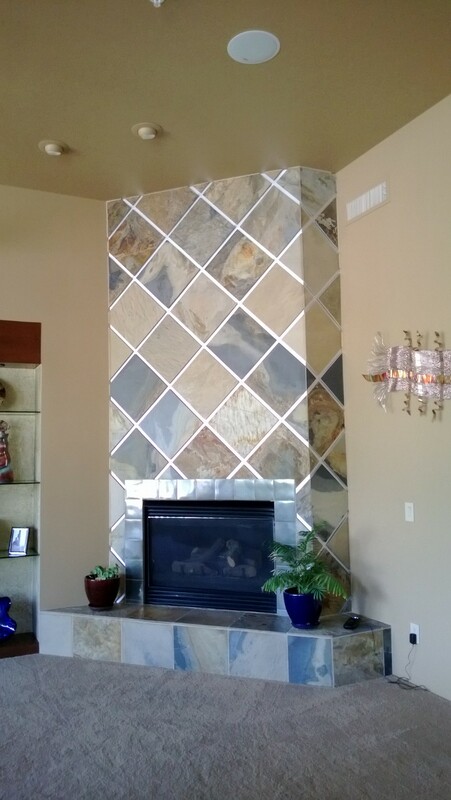 This fireplace was designed by me and my former partner back in 2005 and it’s still fabulous today, if I do say so myself. The stainless steel is actually in between and behind the slate tiles. I remember when they installed it and all the support blocks they had to use to make it happen. There was much cursing, but we knew it would be amazing. I’m happy to report that the clients still love it and so do I! On Oct 1, we finish what was started eight years ago and replace all of the flooring, the kitchen and master bathroom cabinets along with their countertops and backsplashes. We have exactly 30 days to completely transform this place, so it’s going to be a real nail-biter. Stay tuned here for daily updates. 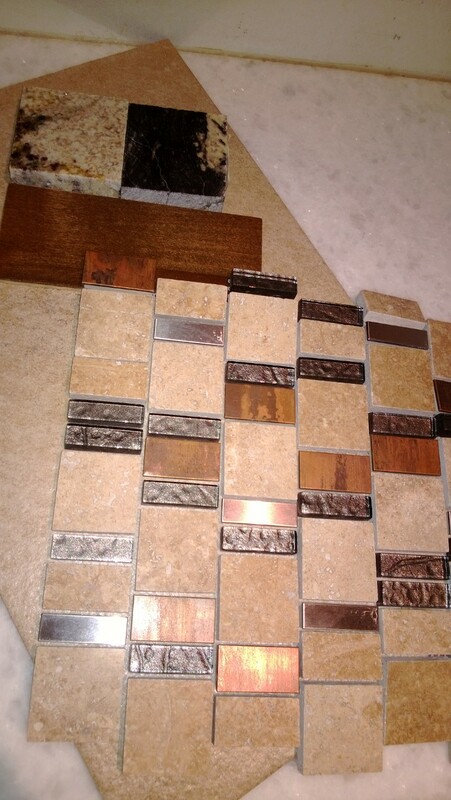 Here’s a glimpse at the materials that have been selected. 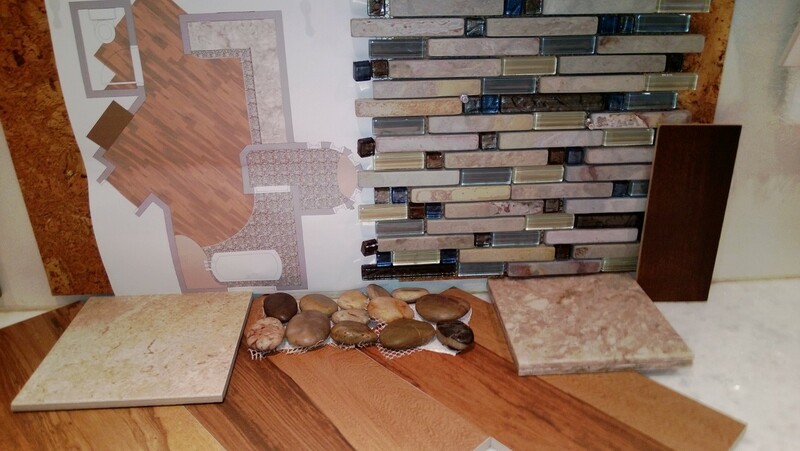 Master Bath: Porcelain wood look, river rock, custom slate and glass mosaic blend and Silestone Quasar countertops. Kitchen: Two types of granite, a custom stone, glass and copper backsplash and a slightly shimmery porcelain floor tile for easy maintenance. Previous Post Las Vegas Market Fall 2013- My inspirations!